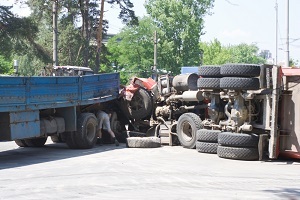 Liability for Jackknife Accidents: Who Pays Your Personal Injury or Wrongful Death Claim? Jackknife accidents are rare, but these types of truck accidents almost always involve serious injuries. If you or someone you love has been involved in a jackknife accident, it’s important to understand who can be held liable for your injuries. A jackknife accident is a type of semi-truck accident in which the cab and trailer fold in at the point of separation, making a 90-degree-angle V shape. This type of accident gets its name because the hinged effect resembles a pocket knife folding into the handle while closing. Some jackknife accidents are single vehicle accidents, but this type of truck accident can also cause a multi-vehicle pileup. In some cases, another car may collide with the truck while it is jackknifing. When a truck jackknifes, there is a potential for a rollover. A truck rollover greatly increases the risk of a fatality. Driver error: Commercial vehicles can weigh up to 80,000 pounds and pull 28-foot double trailers. This increased weight makes them much more difficult for drivers to maneuver. Drivers must complete classroom and practical skills training before earning a commercial drivers license, but jackknife accidents can still occur when an inexperienced driver makes a critical error. Distracted driving: A driver who is not paying attention to road conditions or upcoming obstacles may lose control when he needs to suddenly brake. Impaired driving: Alcohol, illicit drugs, and abused prescription medications can slow reflexes and judgment, leading to a jackknife accident. Adverse weather conditions: Rain, snow, and ice make it hard for a semi-truck to maintain traction with the road. Any loss of traction can cause weight to shift, leaving the cab and trailer to jackknife. High speeds: Jackknife accidents are more common on highways and interstates, because it’s much more difficult for a truck to stop on a dime when it’s traveling over 55 mph. If a driver traveling at high speeds needs to brake suddenly, there’s a good chance the trailer he’s pulling will swing out of control. Curves: Slight curves are unlikely to cause an accident, but steep curves can be problematic for trucks with long trailers. If the trailer end swings too far, this will cause the entire truck to fold in on itself. Equipment problems: Hydraulic failure, brake failure, or other mechanical problems can cause a driver to lose control of his truck, leaving the trailer to swing back and forth before a jackknife accident occurs. What Type of Injuries May Result? If you’ve been injured in a jackknife accident, you’re entitled to file a personal injury claim seeking compensation for medical bills, lost wages, and pain and suffering. If you’ve lost a loved one in a jackknife accident, you can seek compensation for medical costs before death, funeral or burial expenses, loss of future income, and loss of companionship. Since several different parties can be held liable for injuries suffered during a jackknife accident, it’s vital that you obtain skilled legal representation. The experienced personal injury lawyers at Rechtman & Spevak can handle all the necessary case research while working to negotiate the highest possible settlement. Please complete our contact form on this page to learn more.